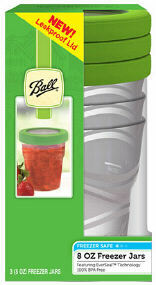 Ball Plastic 8-oz. Freezer Jars help you capture fresh and easy recipes. Simply fill, stack, lock, and store in your freezer! Each jar contains a fill line to allow food to expand in the freezer. Jars are stackable and lock together for a tidy freezer. Easy twist-on lids keep your preserved foods fresh. Contains 3 (8 oz.) Plastic Freezer Jars with Twist-On Lids.